All over the world, the life and works of Scotland’s Bard have been celebrated in the grandest style. Welcome to Africa’s biggest and best celebration of Robert Burns and Scottish culture! This iconic dinner is part of a dynamic global event on or around January 25th each year, celebrating the life and works of Scotland’s national bard, Robert Burns. 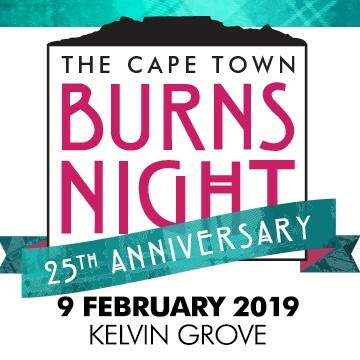 We are delighted that Cape Town Burns Night has grown to be the biggest and most visible in the Southerm Hemisphere. Don your kilt (or touch or tartan) and enjoy an evening that spans a proud tradition of toasts, fine dining, whisky, the regimental Drums and Pipes of the Cape Town Highlanders , Celtic dancers and plenty of Scottish spirit and humour! Everyone is welcome at the Cape Town Burns Night!